Fourth Row Center: Film Writings by Jason Bailey: In Theaters: "The Artist"
“I won’t talk! 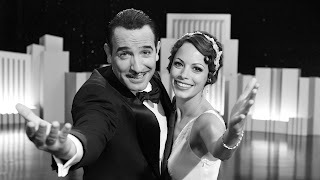 I won’t say a word” go the first titles—the climax of a film-within-a-film, the latest feature attraction for star George Valentin (Jean Dujardin), a Douglas Fairbanks type who looks like he was born in a tuxedo (or a pith helmet). He appears at the film’s premiere, alongside his faithful dog (and co-star) Uggie, and Hazanavicius gets a good bit out of how George milks the audience’s ovation, to the fury of his co-star (Missi Pyle). It’s an applause the actor thinks will never end. It is 1927. Leaving the premiere, George has a charming encounter—captured for the cover of Variety—with an autograph girl/would-be actress, Peppy Miller (Bérénice Bejo), who, wouldn’t ya know it, turns out to be an extra on the film George is shooting the very next day. She is to be a momentary dance partner in a much bigger scene, but he’s so distracted by her charm that he keeps blowing the takes. In perhaps the picture’s most charming sequence, Hazanavicius shows the pair subtly falling for each other over a series of outtakes. His story extends over the next four years, at two year intervals: in 1929, when the introduction of sound spells the end for George (“If that’s the future,” he says in a title, “you can have it!”) and the beginning for Peppy, and in 1931, when George is washed-up and forgotten, and Peppy is a star. The picture is full of quotations—from the period (to inside-Hollywood pictures of the period like Alfred E. Green’s Ella Cinders and Chaplin’s Behind the Screen) and beyond it (there’s a wonderful, quiet homage to Citizen Kane in the photography of a screening room scene). What’s more, it recalls a facet of sound’s rise not often dramatized—the stubborn resistance of silent filmmakers and stars who felt that talkies weren’t “serious.” George is certain that talking pictures are just a passing fad, and when he’s dismissed by his studio boss (John Goodman), he decides to finance his silent picture s on his own, just as Chaplin did. It doesn’t turn out as well for George. The discarding of these onetime stars was a real and tragic thing, and there’s a genuine sadness to the second-act scenes of George’s life in the early ‘30s; it’s the kind of unabashed pathos that the silent cinema did, in fact, do better than sound. There’s a specific way that a well-selected image can break our hearts, and Hazanavicius’s framing of George and Uggie standing in the back of the near-empty house at a screening of his long-labored silent effort does just that. So The Artist is, as countless other reviews have indicated, a movie for movie lovers, a valentine to the cinema, etc.—and thus, as a movie lover and cinema fanatic, this viewer was moved by its sentiment and cheered by its magical ending, which amounts to a cinematic ear-to-ear grin. But it’s also a rather thin picture; one keeps waiting for the moment where it is suddenly about something more than love for movies, the way that, say, Hugo does. That moment does not arrive—and for the target audience, that’s just fine. This is not to say that the romance doesn’t resonate, that the emotions aren’t heartfelt, or that The Artist doesn’t delight. But there’s not much of an entry point for the non-cinephile audience, and when you’re already making a black and white silent picture, that’s a pretty risky move. "The Artist" is in theaters now.